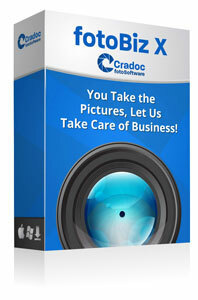 This program is packed with options to help you keyword your images so that they get found online. 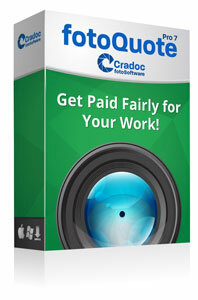 Other fotoKeyword Harvester features include the ability to create keyword templates that will save you time keywording your images, the ability to exclude keyword exceptions and preserve word groups. The fotoKeyword Harvester™ has a way to use the keywording work you’ve already done to save time in the future. Once you have built a keyword block that might be useful as a starting place for similar images in the future, you can save the keyword block as a template that is easily recalled when you need it. When you’ve found a keyword block that comes close to describing the image you’re working on, add the template to your current block of keywords or replace your keyword block with the template. One of the tricks to quickly Harvest as many keywords as possible is to use tabbed Internet browsing. If you’ve never used it, tabbed browsing is a great way to work in a browser. Each of the web pages you’re working with is opened in a different tab, up to ten web pages at a time. Jump between the different sites you’ll use for your research by clicking the different tabs. The pages are always open and always current so there’s no loading time between tabs. This is the perfect way to use the fotoKeyword Harvester to quickly search for words, capture any words that describe images similar to yours, and paste them into the fotoKeyword Harvester. All three major browsers, Safari on the Mac, Firefox and Internet Explorer on Windows and Mac, support tabbed browsing. The Caption tab is a temporary holding place to store captions in case you want to build a caption for the image you’re currently keywording. The caption can be added to the existing keyword block. The Notes tab serves a similar purpose to the Caption tab. It’s a place to keep your notes while you’re researching your keywords. 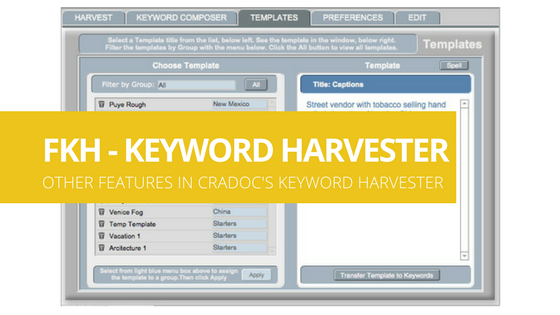 The Coach tab is the place to find detailed information about the fotoKeyword Harvester, including a Keyword Tips tab with information to help you with the basics of keywording your photos. 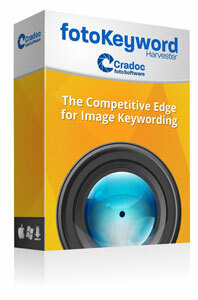 The fotoKeyword Harvester has two screen sizes, big and small. Keep your screen small so you can see your image in your image editing program on the desktop underneath the fotoKeyword Harvester while you work on it. But when you’re trying to edit the keyword block a big screen makes it easier to see. The fotoKeyword Harvester includes a list of Exceptions, such as: a, and, the. Any words in the Exceptions list will be left out of the keyword block when the Harvest Keyword button is clicked. Add more words to the Exceptions list or delete them. You have the option to Preserve Word Groups so any words that you add to your keyword block that do not have a comma in between them are considered to be part of a word group. These words are always separated by spaces or hyphens if present, for example; New York City, New York, United States.